It was that time of year again, when I needed to buy Pappy his Whisky Advent calendar. So, as a dutiful son, off to Master of Malt I went! While I was perusing the Advent calendar selections, I thought..
You know. Since I’m here and all. And since I have to pay for shipping anyway. Maybe I should look for an extra bottle for myself. Oh who am I kidding? I intended to buy myself something all along! My decision centered on finding something that wasn’t too expensive, or too readily available in South Jersey. Also, I knew that I would be hosting my brothers and sisters around the holidays so I wanted something that would appeal to everyone. Awhile back, I had picked up a bottle of Jefferson’s Reserve Very Old Straight Bourbon. And then, during a recent bottle share that I hosted at The Barthenon, Miracle Max pulled not one, not two, but four bottles of Jefferson’s Bourbon out of his bag of tricks (the Reserve, the Ocean, the Rye, and the Groth Reserve are what he brought). We’re still working on getting Max to comprehend the concept of a BOTTLE share, but secretly, we are always waiting to see what and how many bottles he brings to the party. It appears that I have once again digressed. Let’s get back on track. 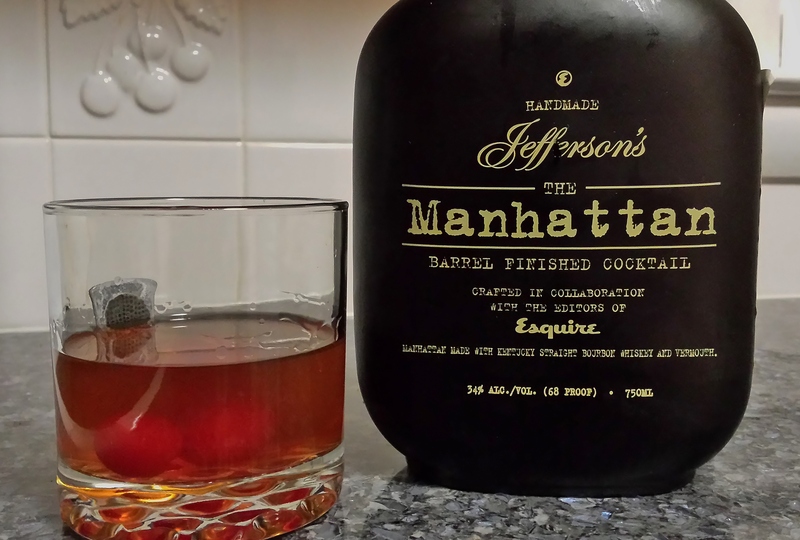 The new Esquire & Jefferson’s Manhattan: Barrel Finished Cocktail was conceptualized in 2013 by Esquire’s Editor-in-Chief David Granger and Jefferson’s Bourbon founder Trey Zoeller, in an effort to provide bourbon enthusiasts with a barrel-finished bottled cocktail that enhances the experience of enjoying a classic. In search of delicious, oaky notes and a well-balanced flavor profile, Granger and Zoeller (aided by various Esquire staffers) tested dozens of recipes together until they narrowed down the options to just three recipes. Those three options were then aged for 90 days in bourbon barrels until just one stood out as a superior Manhattan. The finished product is comprised of six-year-old bourbon – 125 proof cut down to 82.3 – both sweet and dry vermouth, and barrel-aged, spiced cherry bitters. Enjoy it as you would any Manhattan: on the rocks or stirred and strained over ice. Appearance: Reddish orange and a bit cloudy. Aroma: Bitters and bourbon. There is a decidedly sweet aroma with a fresh and fruity smell. Taste: Rich, velvety and a bit syrupy texture with a smooth, smooth, smooth flavor. There is a really nice blend between the two kinds of vermouth and the Bourbon. The cherry bitters and the barrel are a bit of an afterthought. They have a presence but it is more in the background than out in front. I suppose they round out the cocktail and smooth out the flavors. I added a few extra cherries as I like to make sure to get my daily serving of fruit, and the presence of the extra cherries didn’t diminish the flavor at all. While not as strong as some Manhattans that I’ve had, this was pretty good for a pre-made batch. Our holiday dinner was at a BYOB and this bottle (along with an enormous bottle of cocktail cherries) was a big hit. I didn’t need to bring four separate bottles and spend time mixing anything. Just a short pour, and then add cherries and ice as needed. The family event began with a bang as we started off our holiday evening with the just the right beverage (Pappy, Sonny, one of the Connies and at least two BILs were takers). All in all, I was quite pleased with my purchase and will look for it again when it comes time to host a big event. My only request would be an increase in octane. If The Manhattan were bottled at more than 40% it would be fantastic! Nicely done. Perhaps we should experiment with barrel aging our own drinks. Thoughts? Don’t you have a small barrel? I do not. Wookie has the one from the Beam event from a few years ago. Guessing we’d need a charred barrel to do this.